I despise all politics. I suppose someone has to do it, but I always do my best to avoid discussing it either in person or online. I consider it to be a huge success when people don’t know my political leanings (is “away from all politics” a political leaning?). Currently, however, there is a political figure who potentially has asserted that he or she might have distant Native American ancestors (specifically, Cherokee ancestors). For no real reason other than politics, some have disputed the claim, and the media is actually writing stories about it. Trust me, this whole ‘debate’ surrounding one person’s ancestry is so unbelievably unimportant that you don’t want to waste your time to look it up. ... Click to read more! NOTE: This is for the (now outdated) June 2016 Update! The Shared cM Project is a collaborative data collection and analysis project created to understand the ranges of shared centimorgans associated with various known relationships. As of June 2016, total shared cM data for more than 10,000 known relationships has been provided. This is the first update to the original data, released in May 2015. In this update there are more than 4,000 new entries. Additionally, the data for each relationship has been analyzed statistically to remove extreme outliers and produce a histogram to show the distribution. For more information see The Shared cM Project page, and “Autosomal DNA Statistics” page at the ISOGG Wiki. HERE is the link to provide your data for future updates. ... Click to read more! In our culture and economy, we place a value on the goods and services that we create or offer. Since others may not have the time or ability to create those goods or services themselves, we sell what we create to others in order to earn money. As we improve upon those goods and services, it becomes increasingly hard for others to replicate them, and thus the value increases. Similarly, as the demand for those goods and services increases, the value increases. 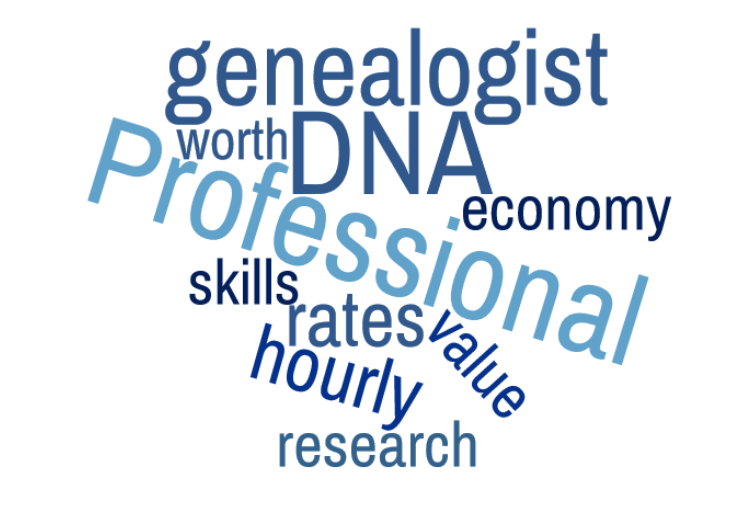 Unfortunately, the services offered by genealogists, including genetic genealogists, are severely undervalued in our culture. One of the most common explanations is that genealogy is a hobby and therefore subscriptions and research services are an unnecessary expense, and/or that people only use “disposable income” for genealogy. (Don’t say that outloud at a genealogy conference!). ... Click to read more! Autosomal DNA is challenging. Although the results of atDNA testing contains vastly more information than either Y-DNA or mtDNA, it is significantly harder to utilize and understand. To wring as much information as possible out of atDNA test, genetic genealogists use every tool available. One of those tools is triangulation. Although the topic of much debate recently, and subject to several important considerations and limitations, most genealogists agree that triangulation is a valuable tool for working with segments (especially among close relatives). Unfortunately, there is a lot of misunderstanding when it comes to what is – and what is not – triangulation. Let’s take a quick look at what triangulation means with regard to atDNA, and why it matters. ... Click to read more!